Bouncing Buttons crafts making it simple: Finding time to blog. Getting to a computer that is inside a house when you spend most of your days outside with the children is hard. I wish we had money to buy a laptop that would be a huge help in getting to the computer. I am going to try to give myself a bit of computer time each morning before I take the children outside. I don't know how this will work but I am going to try. I haven't done a lot of sewing. I plan to take my sewing machine out on my porch this week and sew. I am thinking if I do that I can watch the children and sew at the same time. My pregnancy seems to be going well. I am still feeling sick a lot. Food smells bother me. BUT!!! I have a lot more energy with this pregnancy. I am so thankful for that. My daughter just turned 2 and she is FAST! I feel a lot of my day is spent chasing after her. 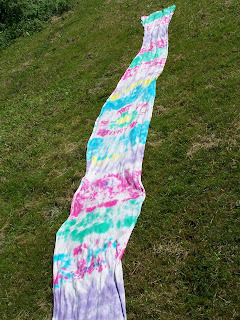 A friend and I got together and tie-dyed hemp baby wraps. I saw this one and thought making one sounded like fun. It was fun. This is a picture of mine laying in my yard. This is a picture of my daughter in it. I have to wear her on my back most of the time because my stomach is getting very large so front carries get harder to do every day. I am around 30 weeks along in my pregnancy. I don't know the exact number so that is give or take a week or two. I have been so busy I haven't had a lot of time to think about and enjoy this pregnancy. 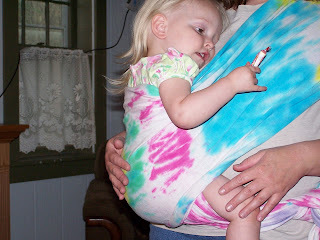 I heard that stretchy wraps work wonderful for little babies so I will try this with the baby this fall. I have done a few other things sewing, spinning, and knitting but not enough to be ready for the baby. I hope taking my sewing machine out on my porch will help me get done all I need to do yet. I will try harder to post updates. I am going to try and talk DH into a laptop. I doubt it will work because he likes the computer in a small room in our house (away from the children). He can go into the room and use the computer. It is a lot harder for me because I have to keep a close eye on the children and my youngest likes to find things to get into. She is always climbing and exploring. I hope to have a stack of cute tiny baby diapers to show you all by the end of the week.